Being active is easier than you think. This does not mean that you have to run a marathon, but it does mean that this should be something that becomes part of your normal routine. Note that 10 minutes at a time is OK.
Two and a half hours (150 minutes) each week sounds like a lot of time, but it’s not. That’s about the same amount of time you might spend watching a movie. The good news is that you can spread your activity out during the week, so you don’t have to do it all at once, even in 10-minute blocks of time. 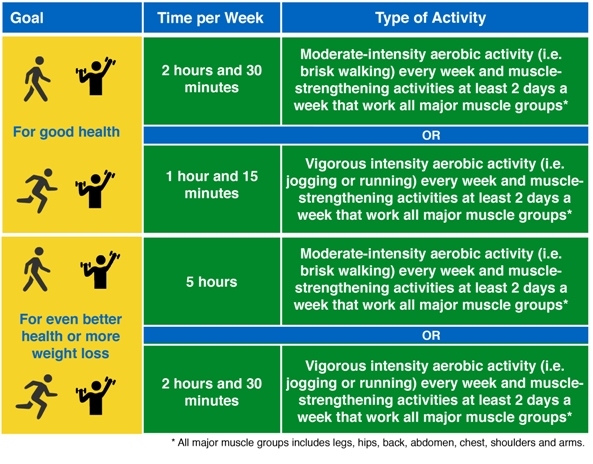 What are examples of moderate-intensity aerobic activity? What are examples of vigorous-intensity aerobic activity? Wear shoes and clothing that feel good. Drink a glass of water before you start and have extra water ready if you need it. Start slowly. After 5 minutes of slow, gentle movement, stop, and stretch. This will help reduce injury and soreness later. Move fast enough that you feel a little out of breath, but no so out of breath that you can’t talk. Slow down again for the last 5 minutes. Now stretch again to cool your muscles down.